Five Nights At Freddy’s 3 CONFIRMED: What Kills Us Next? We know we're getting a new game...but, what will be new about it? If you’re a die-hard (or, even die-soft) fan of Five Nights at Freddy’s, it should have come to your attention about the speculative rumors of a third installment on the way. This has been confirmed on the developer’s main website through shady artwork and watermarks placed on images on the site. Now, this is all well and good that they would add a third installment to the series. After all, the series itself has been a blockbuster since the bite of ’87. But, the question now arises: what new features can we come to expect? For anyone not familiar with Five Nights at Freddy’s, it is an indie horror game released on Steam. The story revolves around your employment as a security guard working the night shift at Freddy Fazbear’s Pizzeria. During the night, however, the pizzeria is not connected to the power grid, and you have limited power. To make matters worse, the animatronics are set in free roam mode, and don’t acknowledge you as a person. This merely means they will try and stuff you in a Freddy Fazbear suit, which would kill you. It’s the job of the player to use a combination of the security doors, cameras, and hallway lights to stay safe until 6 a.m. for five nights. Several months later, Five Nights at Freddy’s 2 was released on Steam as well. After the events of Five Nights at Freddy’s, the restaurant shut down to be renovated. With the last drip of paint finally dried, the new Freddy Fazbear’s Pizzeria is open with new animatronics and more rooms to explore. As luck would have it, you make a horrible career choice and sign up as the security guard again. Five Nights at Freddy’s 2 steps the game up by removing the security doors—which was the main protection against the animatronics. However, this lack of protection is substituted by the use of a Freddy Fazbear head. By wearing this, you can trick certain animatronics into thinking you’re one of them. What does this all have to do with Five Nights at Freddy’s 3, you may ask? It has everything to do with it! Taking a look at the changes between Freddy’s 1 and 2, you notice some major changes in the overall execution of your goal while the main goal remains the same. It is to be expected that the same goal will remain in Freddy’s 3. The question remains, though, on what changes would fit the third installment. Would the addition of new animatronics help? How much more can the player do to defend themselves? Let’s start off with animatronics. In Five Nights at Freddy’s 2, not only do you have the remakes of the original four animatronics, but you have the mangled remains of the originals that are still active. In addition, they added two new animatronics: the puppet and the balloon boy. This raised the animatronic count up to a total of ten, making it that much harder for players to survive. Though it is possible that more animatronics can be added in Freddy’s 3, is it really helpful at this point, or downright brutal? Imagine trying to save yourself against 50 animatronics hellbent on killing you; it’s not a good time. I personally think it’d be time to retire the former animatronics and dish out new ones. Another option is to possibly tie them in with Golden Freddy, where he can disguise himself as one of the older models. Since the game series first started, the player has done one thing: sit. Let’s think about this in a realistic sense. Do you honestly believe that a security guard would stay seated if he heard noises in the building, let alone laughter and screams? I think it’s time that we give our valiant hero the ability to move around. Some people might argue that this may be too big of a change for the series, but it could also be the most involved change to date. The ability to walk around provides you with a sense of security. If you find yourself with an animatronic right down the hall, you can walk away before it reaches you, let alone notice you. On the other side of the spectrum, you may very well find yourself turning a corner, right into the loving killer handles of Foxy the Pirate. There are so many opportunities for change when it comes to Five Nights at Freddy’s. It is never a good idea to use the same engine over and over. In game development, it’s always important to acknowledge and allow change to a series. With Five Nights at Freddy’s 3 on the horizon, it’s best that you get your beauty rest while you can; it’s going to be a long five nights. What are your thoughts on Five Nights at Freddy’s 3? What do you think they should add in this game? Comment your thoughts down below! We could go the Double Switch/Night Trap route and also have to trap the animatronics? That could work. They could also bust out of said traps. If you keep them stuck in the trap, that defeats the whole purpose of surviving until 6 AM. Well, in those games you’d trap the bad guy and then they’d escape. And then in later sequences you’d find a bad guy with a remote that can reverse your traps so you gotta fight for control over the trap until the people you’re saving escape. I’m more interested on where and when the third one will take place. Five Nights 2 is a prequel after all, and there’s a lot of hidden and subtle messages that slowly reveal the overall story of the game. I’m curious to see where they go from there. Are you sure Five Nights 2 is a prequel? I thought it was a sequel due to the addition of the mangled-up remains of the models from the 1st game. Mind though, I haven’t beaten Five Nights 2, so maybe you come to find out it was all a dream or something. 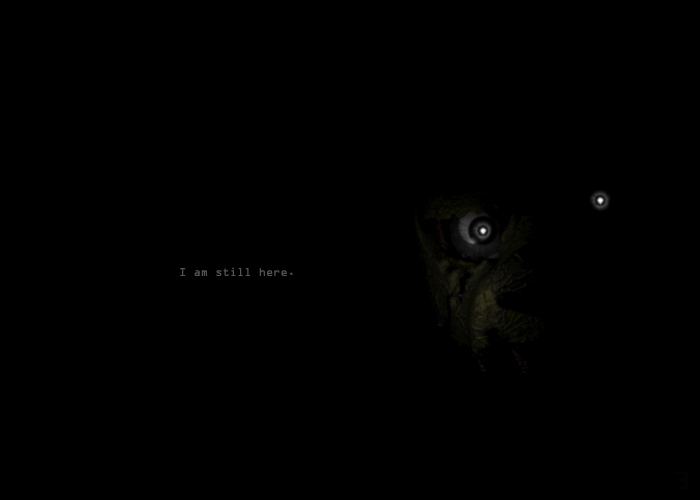 I remember seeing a fan-made trailer for Five Nights 3 that was placed in a mall and you were able to walk around. It was odd, but hey, I guess anything is possible. The way you know is by looking at the checks you earn by the end of the 5th night on each game. In Five Nights 2; the check has a date of 1987; with the minimum wage of that year adding up perfectly to the amount you earn in the game. Five Nights 1 however, doesn’t include a year on its check, so you have to find the year that matches the minimum wage you earn. I don’t remember exactly what year it was, but I know it’s after 1987. Game Theory explains it a lot better than me. Actually! They mention that the mangled old animatronics are from a previous store that went out of business called Fredbear’s or something like that, and are being used as parts and shouldn’t be operational.